Submitted by Emily Brightwell on Mon, 2006-07-24 23:33. A festive Jubilee Ball in honor of Queen Victoria turns into a fatal affair for Hannah Greenwood. 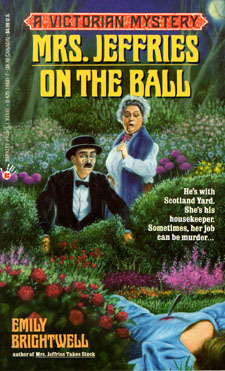 Inspector Witherspoon was a guest at the ball so the job of finding the murderer falls to him. Fortunately, Mrs. Jeffries is there to help him read between the lines.. and identify the guilty party behind this deadly plot..